I hate that now, part of the job of a fashion editor somehow means that you have to dress as if you're a model on the runway. This Toronto Fashion Week, I decided to rebel. This time I wasn't going to panic and buy new clothes. 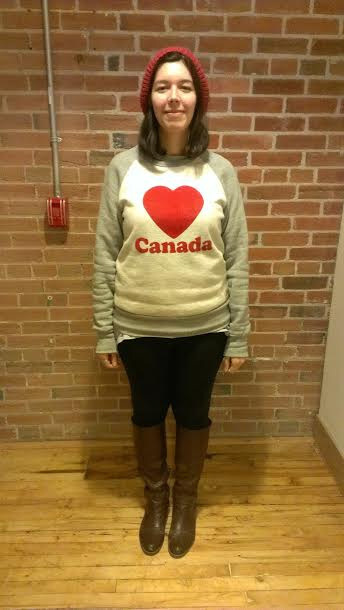 This is what I wore: flat riding boots, black leggings, an oversize "Battlestar Galactica" T-shirt I got from Toronto ComicCon, a Roots "Heart Canada" sweater. After I got home from my first ever Toronto Fashion Week show (Evan Biddell, Fall 2008), I took off my high heel boots, whimpering, and swore I would never subject myself to that torture again. Let me make myself clear: I love watching fashion shows. From the swan-like models and beautiful clothes to the thumping music and watching who's sitting in the front row. What I don't like? Dressing up -- which is a problem, because I'm a fashion editor. I knew this posed a bit of a conundrum. After all, we live in a time where you are your "brand" and what you wear can determine your worth in the fashion hierarchy. It's also a bit of a risky decision because the fashion industry isn't exactly about inside beauty. I didn't come to this decision because fashion weeks have become a spectacle outside the tents thanks to the rise of street style photographers who snap away at bedazzled editors who try to get their picture taken. It's also not about normcore -- it's about comfort. I hate standing around for hours waiting in line to get to my seat which makes my feet ache and blister so much that I seriously consider going home. I hate that Fashion Week makes me stressed out weeks before, when I gaze hopelessly into my closet, realizing that, yet again, I have nothing cool to wear. I hate that now, part of the job of a fashion editor somehow means that you have to dress as if you're a model on the runway. Well, I'm not a model, a stylist, a chic fashion blogger or a Vogue editor. I'm an online fashion editor and I don't think I need to dress to impress the "fashion world" when I'm trying to do one thing: my job, which means attending fashion shows and writing and tweeting about them. When I first attended the shows, I used to spend at least several hundred dollars buying new clothes each season so I would have a few outfits to wear while attending about eight to 10 shows. I would get complimented ("those red heels are bananas, girl" one stranger said to me) but I felt like a fraud amongst all the glittery folks who spent what looked like hours on their hair and makeup and thousands on their designer attire. I was never truly comfortable trying to be someone who I wasn't because in my everyday life I would wear jeans, a T-shirt, flats and maybe a few cute dresses. So, this Toronto Fashion Week, I decided to rebel. This time I wasn't going to panic and buy new clothes. I wasn't going to run into work late because I spent the whole morning trying to decide what to wear. I wasn't going to be uncomfortable while trying to do my job. This is what I wore: flat riding boots, black leggings, an oversize "Battlestar Galactica" T-shirt I got from Toronto ComicCon, a Roots "Heart Canada" sweater, a forest green military-esque jacket and a Roots leather backpack. Oh, and since it was pouring rain, I wore a beanie and accessorized with a broken purple umbrella. Glamorous? Nope, but I felt comfortable when I waited for a half hour in line for my Pink Tartan ticket and three shows later, I wasn't exhausted or in pain from wearing high heels (I even got a Twitter compliment on my backpack). Surprisingly enough, even though I didn't look like a "typical" fashion editor (I leave that to my fabulous colleague and Stylelist Canada editor, Julia Brucculieri), I didn't feel out of place amongst Canada's style elite. No one stared at me with "what is she doing here?" eyes; no one asked me whether I was in the right place. Sure, I won't be in a style blog or be part of Flare's roundup of Toronto Fashion Week street style, but that's not why I attend the shows. I had a lot of fun watching what others wore: Caitlin Power, a fashion designer, looked stunning in a revealing white blazer and to-die-for black and white heels and model Stacey McKenzie changed three times (once for each fashion show she attended that night). I love fashion and I'll always be amazed and inspired by the men and women who wear such creative and fantastic outfits at Fashion Week. But I'm not one of them, and I'm OK with that.